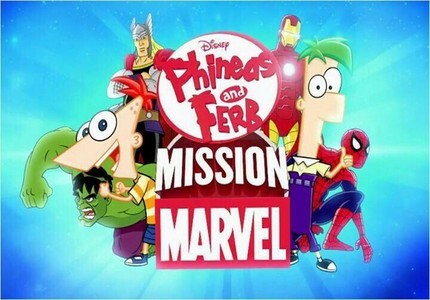 Phineas and Ferb with Marvel Superheroes. Who else is excited for this epic episode? I know I am.. Wallpaper and background images in the phineas y ferb club tagged: phineas ferb disney channel marvel. This phineas y ferb photo contains animado, cómic, manga, historieta, anime, and dibujos animados. Did you see the new episode? I made a mission marvel club.